What a lovely slab of eighties horror! 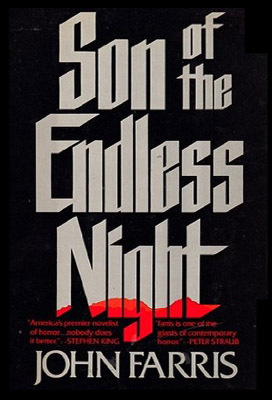 John Farris deftly combines two genres, horror and courtroom drama in this 1985 novel, and coats it all with some lovely, inch-thick demonic cheese. And man, the result is tasty. It’s tasty as hell! The story gets off to a slow start; there’s Richard Devon and his girlfriend Karyn, a missing girl and a coven apparently led by an apparently long-dead woman. Rich goes on a search for the missing girl and finds her, as well as the demon who possesses her. Promptly the demon possesses him instead, and soon he’s bludgeoning Karyn to death with a tire iron. The authorities lock him up, and send for his brother Conor, a former priest who has become a professional wrestler (as you do) with the brilliant nom de plume Irish Bob O’Hooligan. Along with a pair of eager lawyers Conor soon figures out that Rich done the deed while possessed. So, they go for a plea of not guilty by reason of demonic possession. It’s a sweet premise, and Farris executes it with writing to match, with the occasional epic phrase here and there that might make even longtime horror readers swoon a little. The action is constant; even from behind the bars, the demon and his accomplices manage to stir up a lot of trouble. The main storyline is excellent, constantly pedal to the metal, with a hearty helping of all things satanic, almost over the top but not quite. But there may be a question of too much of a good thing; the long sideplot late in the novel about Conor’s wife Gina and her adventures with a pair of broadly caricatured Southern bible thumpers (in their amazingly pimped Christian truck) does go wildly over the top. It’s ridiculously fun, of course, but it’s also just ridiculous. Neither does the novel’s whimper of an ending quite pack the punch one has begun to expect. But those a minor complaints. 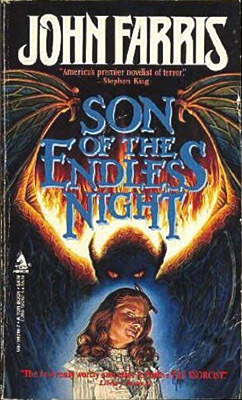 Son of the Endless Night is a juicy one, full of tickly good moments. It doesn’t necessarily contain any great wisdom, nor is not the subtlest of novels – but it’s a hell of a lot of fun, and despite its 500-page length it’s a breeze of a read. Classic eighties horror. First published in 1985 by St. Martin’s Press. Available in multiple formats.